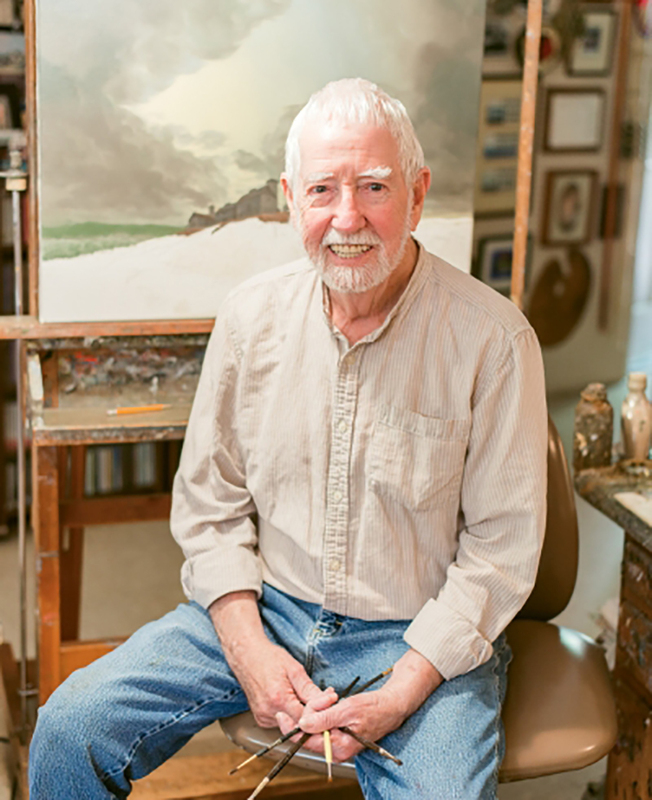 When Ward Nichols turned 80, the Wilkes Art Gallery held a retrospective exhibit and complied a book of his paintings, at least one for every year of his professional career. The book showcases a lifetime of hyper-realistic oil paintings running the gamut from delicate Blue Ridge landscapes to photorealistic portraits and still lifes to the abstract and surreal. The common thread is his extraordinary attention to detail, revealing the cracked paint on a barn, individual blades of grass, leaves in a tree, or pebbles on a dirt road. Seldom does he work from photographs, but prefers, instead, to sketch out his subjects. Occasionally he works from imagination, explains Cindy Pardue, executive director at the Wilkes Art Gallery, which is hosting an exhibit this fall of Nichols’ work to mark another milestone: his 50th year as a full-time artist. After high school, Nichols joined the Navy with plans to enroll in a drafting school, but wound up being stationed in Italy, where he spent his free time taking in the works of da Vinci, Michelangelo, and the Old Masters of the Italian Renaissance. Now at age 86, the self-taught painter has much to show. His work is in many private collections and has appeared in several hundred galleries and exhibits around the world, and he’s received dozens of notable awards. One of his fondest memories is being asked to present one of his pieces to astronaut William Anders after his 1968 mission to the moon. Anders returned the favor by sending Nichols a copy of the famed photo he took of Earth. “He told me he was sending me a sample of his artwork,” says Nichols. The following year, the painter was even invited by NASA to represent the arts during the Apollo 12 space launch.